Home > What is Occupational Therapy? Welcome to Occupational Therapy at the Center of Development! We are excited that you have chosen to help your precious one with medical based therapy! We know that this is a huge commitment for you and your family, and we greatly appreciate your time and effort in helping your child reach their maximum potential. Arriving at therapy sessions weekly is very important to their success in therapy as well as carrying out home activities. This intro packet is designed to educate you on some of the therapy techniques commonly used to help your child, and to help you understand what we do! Occupation refers to activities that support the health, well-being, and development of an individual (American Occupational Therapy Associa­tion, 2014). For children and youth, occupations are activities that enable them to learn and develop life skills (e.g., preschool and school activities), be creative and/ or derive enjoyment (e.g., play), and thrive (e.g., self-care and relationships). Occupational therapy practitioners work with children, youth, youth families, caregivers, and teachers to pro­mote active participation in activities or occupations that are meaningful to them. Occupational therapy practitioners work with children of all ages and abilities through the habilitation and rehabilitation process. Occupational therapy practitioners collaborate with parents/caregivers and other professionals to identify and meet the needs of children experiencing delays or challenges in development. Occupational therapy practitioners collaborate to identify and modify or com­pensating for barriers that interfere with, restrict, or inhibit functional performance. Occupational therapy practitioners teach and model skills and strategies to children, their families, and other adults in their environments to extend therapeutic intervention to all aspects of daily life tasks; adapting activities, materials, and environmental conditions so children can participate under different conditions and in various settings (e.g., home, school, sports, community programs). Participating in age-appropriate daily routines. Occupational therapy practitioners have training in psychosocial and mental health conditions and are well suited to address children’s emotional and behavioral needs as they relate to the sensory aspect of everyday activities and social interactions. For example, occupational therapy practitioners help children develop the ability to cope with sensory challenges and use sensory calming strategies to deal with frustration, defuse anger, and manage impulsivity in order to succeed at indi­vidual tasks and collaborative interactions at home, at school, and in the community. Sensory integration involves perceiving, modulating, organiz­ing, and interpreting sensations to optimize occupational performance and participation. This includes vestibular (movement), proprioception (joint receptors, body awareness, position in space knowledge, grading of movement, muscle tone), touch, olfactory, auditory, visual, and oral sensory. These sensations have to work as a team and integrate well in order to function normally. Well-regulated and appropriately functioning sensory systems contribute to important outcomes in social-emotional, physical and motor, communication, self-care, cognitive, and adaptive skills development and main­tenance. Deficits in sensory integration can pose challenges in performing activities of daily living (ADLs), in addition to de­velopment, learning, playing, working, socializing, and exhibit­ing appropriate behaviors across many environments (Schaff & Smith Roley, 2006). Sensory integration and modulation disorders often lead children to have extreme over reactions to what others consider mild stimuli, or to completely shut down, be anxious, or disengage like many children with Autism. These children are often stressed and overwhelmed. Some children are sensory cravers- they may crave too much movement & touch like many children with ADHD. Differenc­es in interpretation of stimuli can impact motor skills and coordination, further limiting a child's development, especially with motor skills, much like children with developmental delays, low muscle tone and/or coordination issues (dyspraxia). The sensory integration theory and intervention methods researched and developed by A. Jean Ayres, Ph.D., OTR/L, provide a neuroscience-based approach to addressing sensory integration concerns. Without intervention, issues in sensory integration continue into adulthood and have been reported to impact work performance, relationships, and general functional abilities (Kinnealey, Koenig, & Smith, 2011). We are here to help! Most are familiar with the 5 basic senses, but the most powerful senses that act on our brain are actually those of vestibular (movement), proprioception (joint and muscle) & touch! The sensory sub-cortical processes need to be working well (such as sensory processing) to give the FOUNDATION for functional life skills on the higher levels. We are here to help your child develop more independent skills and reach their greatest potential! We provide “just the right challenges” to help them achieve new skills in each therapy session and build their self-confidence. Our therapists have worked exclusively with pediatrics for many years! Sensory & movement breaks to get the oxygen flowing. This approach was developed and researched by Bonnie Hanschu, a leading OT in the area of neuro-behavioral & neuro-transmitter based therapy treatments. Using this approach the child is “ready to learn” after vestibular, proprioceptive & deep pressure touch therapeutic procedures like swinging, balance activities, jumping, and weighted therapeutic procedures. We work on primitive reflex integration each therapy session with training for home to gain optimal motor coordination to help the child acheive the highest level of motor coordination possible. This is why 7 therapy rooms at the Center of Development have a single point hung swing! The vestibular sensation comes from the inner ear and is the most powerful sense, helping to regulate and integrate all the other sensations. Swinging activates the vestibular system greatly, causing a ripple effect to all other sensory systems for improved integration with vision, coordination, postural control, listening skills and attention. When we can combine swinging with eye-hand coordination tasks and visual activities we can greatly improve a child's visual-vestibular integration which leads to much improved visual attention, seated attention and postural control for all other functional skills. Our joints and muscles play a very important role in our coordination, balance, motor skills for daily functional tasks, postural control, muscle tone and how long we can sit and attend. Proprioception is the feeling of where your joint is in space without looking. This is vital to good coordination and muscle coordination. Jumping, creeping on all 4's, scooter board fun, pushing, pulling, and lifting weighted balls are all used to increase the joint signaling and improve strength. A child's core strength and stability is a huge factor in how balanced and coordinated they can be in fine motor tasks. Activities to improve core strength and stability are vital to helping a child gain strength and stability in the center of their body, allowing their extremities to do the fine motor tasks. A strong core along with integrated vestibular processing will help a child be able to sit and attend without fidgeting or slumping. The overall impact of proprioceptive & vestibular activities is good body awareness to calm the central nervous system, improve coordination & increase focus and attention for fine motor and functional life tasks. Most of us are not aware but we have two very specialized touch systems on our skin. Light touch receptors are there to protect us. A fly lands on your skin, you are alerted by your brain and you swat it away to protect yourself, the stress is momentary, but very real. Unfortunately, many children have overly sensitive or hyperactive touch systems which are alerting them constantly and causing them great stress over every light touch they encounter. They often over-react to things like tags, clothing textures, being touched in a crowd, messy textures, foods, etc. This causes them GREAT stress all day and all night. The other touch system we have is deep pressure touch. This is the system that helps you feel calm when hugged or massaged. Therapeutically, we use the deep pressure calming touch system to treat the over-reactive light touch system. This is why you may see your OT using a brush on the skin, rolling a ball over their back and arms, using vibration pads, weighted blankets, weighted vests, hand hugs and other researched therapeutic interventions. The touch system needs calming deep pressure touch every 1.5 to 2 hours to overcome the stress of the light touch hypersensitivities. Calming deep pressure touch activities will be demonstrated for you to do at home and carry over into all environments to help your child stay calm and less stressed. We use sensory calming spaces as options for your child to "re-boot" when overwhelmed. We may use a lower back vibration cushion and move and sit seat wedge to help them sit for longer periods in therapy. Weighted vests, weighted blankets and massage vibration mats are options to try in therapy and we can help you carry these over in the home environment! Just like eating a healthy diet is very important to your brain and muscles, so is a healthy sensory diet daily. A sensory diet plan includes the daily therapy activities that will help your child's brain be ready to learn and complete all the development & motor challenges they face daily. A regular dose of sensory-based therapeutic activities carried out in the home and school environments will give them the vital brain and muscle food they need. Sensory activities directly affect your child's brain neuro-transmitters which affect mood, attention & focus. Some of these sensory activities are quite simple like swinging, jumping and exercising daily. These sensory diet plans are detailed in your OT evaluation but may be tweaked and individualized more by your treating therapist as we learn more about your precious one. We live in a very sedentary society. Our children are forced to sit at too young of an age for long periods of time. Due to the high demands of the sedentary classroom environment at a very young age, it is important that the home environment includes lots of movement and safe outdoor playtime. Having a swing set and playground, or at least going to the park often, is very important to help them be able to sit later at the dinner table or at school. Sedentary electronic play at home will not help your child suceed in the school environment. Hands on learning and playground play will help them greatly! Children with sensory processing disorders often are very stressed and overwhelmed, the best calming activity for them is to be able to come home and swing, run, jump and play. Being in nature is calming due to the greens and blues they look at release calming brain chemicals. Opportunities to jump on mini trampolines indoors or a safety netted trampoline outdoors can help alleviate stress, and help them calm and improves muscle strength and tone greatly. Activities such as running or riding a bike are wonderful and should be encouraged for at least an hour a day in place of near electronic play or TV watching. They will sleep better at night too! Contact Heidi Clopton if you would like to learn more about how healthy eating can greatly affect your child's development, attention, sensory processing and help them naturally. The websites at the end of this document will help for education on how nutrition affects mood, behaviors, and development. • Collaborate with families, physicians, nurses, speech-language pathologists, physical therapists, psycholo­gists, teachers, employers, and other professionals to determine the need for specialized evaluation and intervention. • Identify and modify sensory and environmental barriers that limit performance and participation in every­day activities, as well as individual strengths and supports. • Teach and model activities to support sensory, motor, and behavioral needs. • Identify and provide adaptive sensory and motor strategies and interventions using a variety of sensory approaches to facilitate full participation in daily routines and social interactions. • Help raise an individual’s self-awareness of the impact of sensory and motor factors on everyday activities and real life situations, and provide ways to counter sensory processing challenges. • Infants and toddlers at risk for developmental problems or who have disabilities. Occupational therapists identify sensory and motor difficulties and provide interventions to facilitate effective self-regulation (wake–sleep cycles, alertness level, self-soothing), motor development, and adaptive behavior. These interventions allow children to focus on successful occupational performance in areas essential for development, such as play, sleep, ADLs, mealtime routines, and socialization (Ayres, 2005; Schaff & Smith Roley, 2006). • School aged children with sensory integration problems. A variety of sensory-based approaches can address life skills, participation, and behaviors needed at home, in the community, and in the classroom. In addition to direct intervention, modifications to the home and classroom environments may be recommended to assist children with participating in daily routines, being independent with self-care skills, progressing at school, playing, making friends, and focusing in order to learn (Ayres, 2005, Schaff & Smith Roley, 2006). • Adolescents and young adults with a fear of movement, sensitivity to touch, poor motor planning, or de­creased awareness of body position in space. Sensory integration problems may interfere with age-appro­priate life activities such as learning to drive, making vocational choices, engaging in leisure activities, and developing independence and romantic relationships. Practitioners may provide direct occupational therapy interventions to address sensory integration and modulation issues and/or may provide accommodations and education to facilitate and improve an adolescent’s functioning. As these young people transition into lifelong work and leisure experiences, occupational therapy practitioners can play an important role in iden­tifying and supporting successful performance in these areas (Kinnealey et al., 2011). 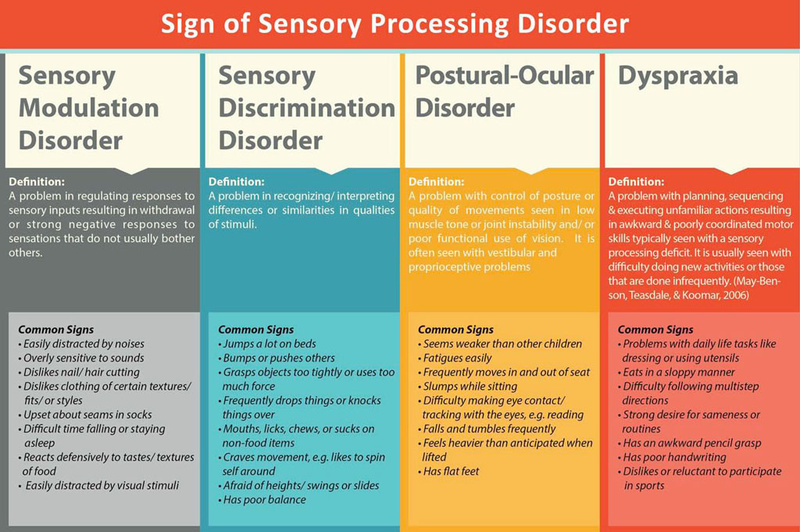 www.spdfoundation.net Information on sensory processing disorders, current research and more! Ayres, A. J. (2005/1976). Sensory integration and the child. Los Angeles: Western Psychological Services. Schaff, R. C., & Smith Roley, S. (2006). Sensory Integration: Applying clinical reasoning to practice with the diverse population. Austin, TX: Pro-Ed. Copyright © 2015 by the American Occupational Therapy Association. This material may be copied and distributed for personal or educational uses without written consent. Occupational therapy enables people of all ages to live life to its fullest by helping them to promote health, make lifestyle or environmental changes, and prevent—or live better with—injury, illness, or disability. By looking at the whole picture—a client’s psychological, physical, emotional, and social make-up—occupational therapy assists people to achieve their goals, function at the highest possible level, maintain or rebuild their independence, and participate in the everyday activities of life. Occupation is confusing to hear when we think of a child. What are the "occupations" of a child? Developing motor skills, crawling, creeping, walking, playing, eating, learning, school academics, paying attention, dressing, leisure skills, writing, reading, sports, the list is endless on the "occupations" a child needs to learn. Occupational therapy focuses on how to help a child achieve all the skills needed to be the best they can be. Behavioral disorders that are related to sensory issues. We essentially treat any child that has difficulty functioning at a developmentally appropriate level and is interfering with their academic, social, emotional, and other life skills. We use assessments and treatment approaches that are very in depth so that treatment plans and goals address underlying developmental issues. Our treatment sessions are much more intensive than educational therapies since we are medically based therapy. By treating the lower levels of the brain processing first (ex. sensory functions, developmental milestones, motor coordination, sensory processing, sequencing), then working up to higher cortical tasks (ex. reading, writing, math, complex problem solving, self esteem, sensory integration) we can give the child the building blocks and developmental skills needed to developing more normally and reach optimum higher cortical functioning for the rest of their life. 1. Developmental Milestones: which ones were missed, which ones done incorrectly, crossing of midline, coordination of opposite sides of the body such as creeping and crawling patterns, crossing midline, sequencing body movements, reflexive patterns and integration of reflexes, timing and sequencing, long and short term memory, hand, eye, leg, and ear dominance, motor coordination. Standardized tests and clinical observations are used depending on age and ability. Bayley Scales of Infant Development is used for 5 and under. BOT-2 is used for 5 and up. If any developmental milestone such as creeping less than 4 months is missed or impaired, then there is usually a consequence of development later in life, usually seen in 6-7 years when it is time to learn to read or sit longer in class. By doing therapy to "fix" these developmental delays, we can greatly change how the child learns, attends, and focuses. Attention in many differing environments. Attention and focus in sitting are greatly dependent upon adequate sensory processing, vestibular processing, and core strength. If there is a disturbance in sensory processing skills, then this shows up as in-attention, fidgeting, inability to sit still, and poor visual focus. 3. Perceptual skills: Visual perceptual skills with standardized testing pre and post therapy to show results, long and short term memory, hemisphere dominance, handwriting and left-right laterality and directionality skills are assessed. We use standardized tests like the BOT-2, VMI, Jordan and more if needed. Difficulties with visual perceptual skills can cause delays in reading, writing, visual scanning worksheets, visual attention, and even cause reversals in reading and writing. 4. Fine Motor Skills and Self-Help: In-depth evaluation of fine motor abilities for a child's daily life skills will be assessed using standardized testing and clinical observations. Delays in fine motor coordination can greatly affect a child's self-esteem and cause frustration in school and home skills. Early treatment of fine motor and self-help delays is essential to help them gain more confidence and prevent awkward grasp patterns. 5. Balance and Motor Coordination: A child's balance skills can greatly affect their ability to sit and attend in a chair at school, or do well in sports. Their balance and coordination skills directly affect their playground skills and normal development. We believe that a child's balance, motor coordination, and overall motor development along with their sensory processing skills are the foundation for improving functional skills. Standardized testing along with clinical observations will be used in evaluations to determine their balance, vestibular functioning, vestibular-visual-proprioceptive integration, and overall motor coordination. Occupational therapy sessions that integrate motor coordination skills along with sensory processing skills are more effective and can help get quicker outcomes! Using a therapist that is trained in primitive reflex integration, sensory integration and motor development can help your child reach their developmental goals quicker! 6. Medical History: possible food allergies or sensitivities discussed, nutritional needs, developmental lags such as poor creeping and crawling patterns, illnesses, history of ear infections or fluid on the ears, sensory processing issues, and other important factors in developmental history that can cause missed or delayed neuro-development.